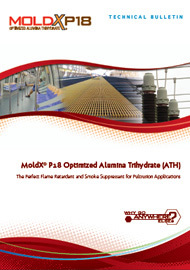 We are pleased to introduce a Technical Bulletin for MoldX® P18 Optimized Alumina Trihydrate (ATH), an ideal flame retardant and smoke suppressant for Pultrusion-related applications. Before things heat up, click on the image at right to download your copy of the Technical Bulletin and learn about how this innovative fire retardant additive technology can help in your next Pultrusion application. Contact Us now for a product sample.